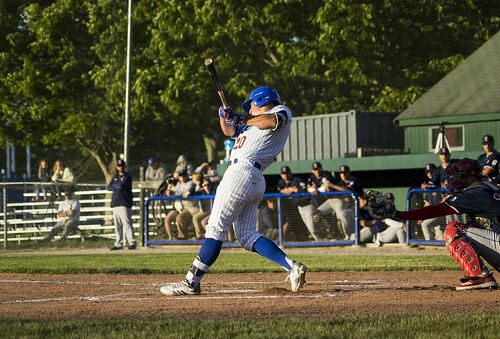 CHATHAM — The Chatham Anglers found runs hard to come by in game one of Sunday’s doubleheader against Cotuit. They didn’t record their first hit until the third inning. Cotuit starting pitcher John Baker (Ball State) cruised through six innings on just 66 pitches. During that span, the A’s had just 20 at-bats. Spencer Torkelson launched his league-leading fifth home run in the seventh inning. It was only when Baker was relieved by Deacon Medders (Alabama) in the seventh that Chatham got on the board. A solo-shot from Spencer Torkelson (Arizona State) in the bottom of the frame kept the Anglers (6-4-2) from their first shutout of the season as they lost to the Kettleers (7-5), 6-1. Spencer Van Scoyoc (Arizona State), who has thrown three innings in relief this summer, made his first start of the season. The left-hander plunked Cotuit leadoff batter Will Robertson (Creighton) with the first pitch of the game, and it ended up costing him a run. Over the span of four pitches, Robertson stole second, advanced to third on a wild pitch, and came home on an Eric Jones (Davidson) RBI single. While Van Scoyoc trudged through his start, Baker cruised. Baker made quick work of Chatham’s batters and faced the minimum in each of the first three innings. The A’s managed a baserunner in the first and third, but both times, a 5-4-3 double play ended the frame. Despite Van Scoyoc’s struggles, including two hit-by-pitches and two walks, the Arizona State product held the Kettleers to just one hit — Jones’ RBI single. Van Scoyoc tallied five strikeouts in four innings, his longest outing of the season. The bottom of the fourth inning was the first time Baker faced more than three Chatham batters, but the right-hander threw just nine pitches. Baker tossed six scoreless innings, striking out five. Andrew Miller (Kentucky) made his first pitching appearance of the season in relief of Van Scoyoc, and immediately he ran into trouble. After pelting Peyton Burdick (Wright State) and surrendering an infield single to Zach Humphreys (TCU) to open the inning, a mistake by Miller gave Cotuit its second run. After a double steal put Humphreys and Burdick on second and third, Cotuit’s Cory Wood (Coastal Carolina) laid down a suicide squeeze. Miller reacted quickly and fielded the ball in time to catch Burdick at home plate, but rather, he opted to throw to first. Burdick crossed the plate with ease to double the Kettleers’ lead. In the top of the seventh, Cotuit used the same tactic to get its third run of the game. Cam Jabara (Orange Coast) hit Burdick with a pitch — Chatham’s fourth hit batter of the game — sparking another Cotuit run. With runners on second and third, Beau Brundage (Portland) bunted to Jabara, who whipped it to first to record the out. Burdick, who stayed near third on the bunt, broke for home Jabara’s throw. Jorge Arenas’ (Stetson) tried to nail Burdick at the plate, but the throw sailed beyond Taylor, and Burdick reached home safely. As the inning went on, things worsened for the A’s. An RBI single by Michael Toglia (UCLA) and a Zach Biermann (Coastal Carolina) two-run home run extended the Cotuit lead. Once Baker was relieved by Medders in the seventh, the Anglers finally got on the board. Torkelson launched his league-leading fifth long ball of the season, a solo-shot into the woods beyond the left field fence at Veterans Field. Despite the discrepancy of the final score, the two sides registered the same amount of hits (five). The Kettleers’ took advantage of two walks and four hit-by-pitches paired with aggression on the basepaths to score its six runs.